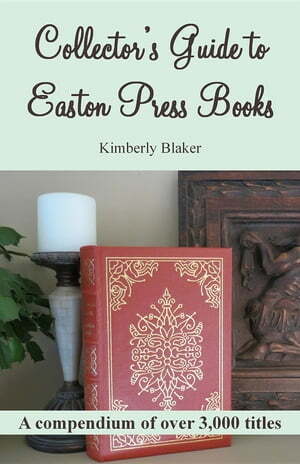 Collins Booksellers - Collector's Guide to Easton Press Books by Kimberly Blaker, 9780972549646. Buy this book online. This handy reference guide contains an semi-exhaustive list of Easton Press books. It contains more than 3,000 entries of Easton Press titles, both in-print and out-of-print. The Collector’s Guide to Easton Press Books provides numerous lists of Easton Press collections and is broken down by sets and series. It also includes many stand-alone titles as well as signed, first, and limited editions. In this well-organized reference guide, Easton Press collectors will discover numerous out-of-print titles they’ve likely never heard of but surely will want to add to their libraries to complete their collections. The following are just a few of the series found in the Collector’s Guide to Easton Press Books: 100 Greatest Books Ever Written (well-over 100 titles, actually); Baseball Hall of Fame; Books That Changed the World; Collector’s Library of Famous Editions; Deluxe Limited Editions; First Edition Library; Glorious Art; Great Books of the 20th Century; Greatest Adventure Books of All Time; Horror Classics; Library of American History; Library of the Civil War; Library of Fly Fishing Classics; Library of Great Lives; Library of Military History; Library of the Presidents; Masterpieces of Science Fiction; Nautical Library; Readers’ Choice; Science Classics; Signed First Editions; Signed First Editions of Science Fiction; Signed Modern Classics & Miscellaneous Signed Editions; Stand Alone Editions & Small Sets; More.